The summer of 1968 is a time of personal growth for one 12-year-old who must face his fears in RP Burke’s novel, The Fort. Jackson “Jack” O’Malley looks forward to a summer of playing baseball, hanging out with neighborhood friends, and exploring the nearby woods. Soon, Jack’s 13-year-old cousin Elbert arrives to spend the summer. Elbert’s father died in a recent car accident and Elbert is struggling with his grief. Still, he’s game for anything – until he and Jack are confronted in the woods by a man with a gun and Elbert becomes determined to find out what the man is up to, dragging reluctant Jack along. The mission soon turns deadly, and Jack must act quickly—before he loses his nerve. 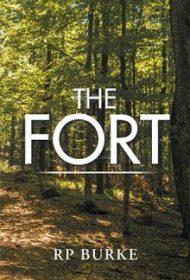 It’s also unclear why “the fort” is in the title, since Jack’s treehouse fort has little significance in the story. The target audience is equally unclear. While it seems most appropriate for middle grade readers, the book isn’t labeled as such. Tweens may relate to Jack’s angst at playing in the baseball championship or deciding if a neighborhood girl is flirting with him, etc. Even these readers, however, are likely to find Jack’s heroic exploits rather preposterous, as will a general audience.